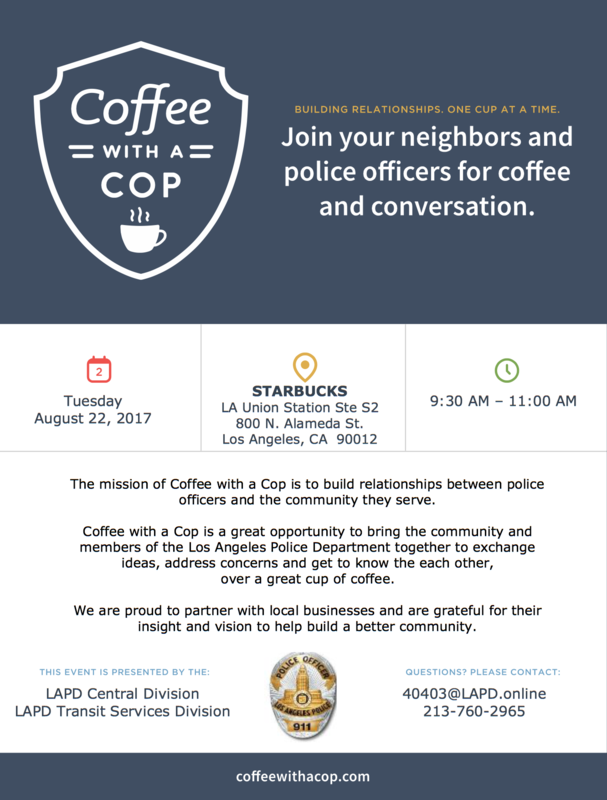 LAPD will be hosting Coffee with a Cop on Tuesday, Aug.22 from 9:30 a.m. to 11 a.m. Join the officers from the Central and Transit Services Divisions just outside the Starbucks in Union Station. You’ll have the opportunity to meet some of the officers patrolling the Metro system, ask them questions and get to know them a little better. Metro’s Community Education department will also be on hand to answer transit-related questions and promote rider safety. Metro’s robot train will be making a special guest appearance! No 405 closure tonight — bridge work completed early! Will donuts be served with the coffee on Coffee with a Cop Day? Just kidding! However, one late, dark and rainy night in the Chicago I stopped at a donut shop for a cuppa’ hot Joe. I noticed the shop from the highway because it was surrounded by 4 police cars, one each from the Chicago PD, the County Sheriff, the CTA Transit PD and the State Police. Given that cops will take a bullet meant for you or me–think San Bernardino–they are welcome to all the donuts and java they want!